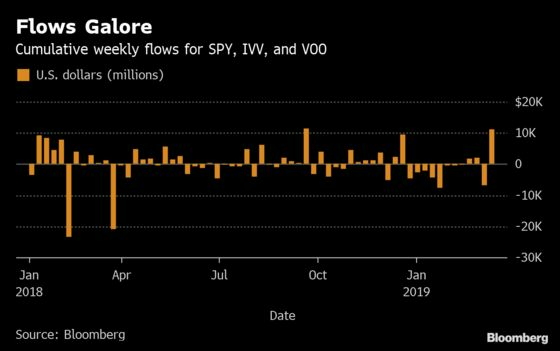 (Bloomberg) -- Inflows into the three biggest exchange-traded funds that track the S&P 500 Index spiked as the benchmark U.S. stock gauge enjoyed its best week of the year amid technical factors that may have juiced activity. State Street, Vanguard and BlackRock’s offerings pulled in more than $11 billion last week, the most since the five days ended Sept. 21. That stretch included the S&P 500 Index’s record close of 2930.75.